Join us for an evening of live entertainment and help make a local difference. 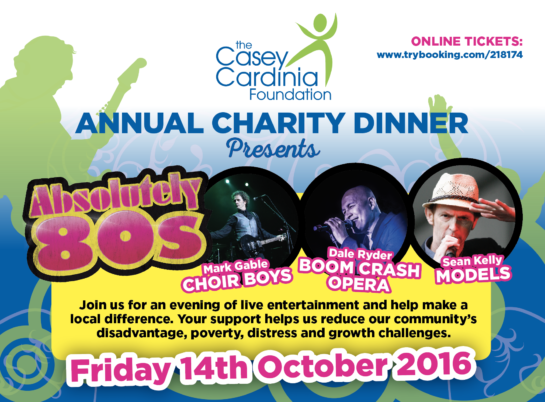 Your support helps the Casey Cardinia Foundation reduce our community’s disadvantage, poverty, distress and growth challenges. The Foundation is renowned for presenting a “not to be missed” program of entertainment since 2004, raising more than $400,000 for the local community. 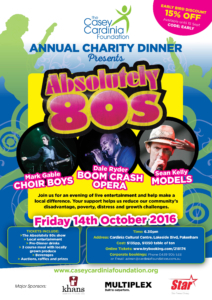 Our 2016 entertainment is one of Australia’s most successful shows, the ‘Absolutely 80’s’ featuring original singers from the Choir Boys, Boom Crash Opera, and the Models. An Early bird discount of 15% is available up until the 15th September, simply enter the code EARLY at the online checkout. All monetary donations over $2.00 are tax deductible. Should you require a Purchase Order, have a booking or auction enquiry, please contact our Executive Officer, Therese Howell on 0439 905 533 or admin@cardiniafoundation.com.au.